The American Internet is atwitter after Microsoft announced last week that it had patented a mobile application technology giving pedestrians directions that avoid high-crime areas. An early story from a Seattle TV station dubbed it the "avoid ghetto app," and the avalanche began. Twitter is exploding with links to tech blogs, witty 140-character opinions and links to online debates: Is it racist? Does it protect women? MSNBC, which is owned by Microsoft, attempted to weigh in on the budding controversy by mentioning that they never used the term "ghetto." An AOL reporter actually did some reporting, talking to experts who compared the tool to redlining and found it "appalling" and others who said it was "creepy" but useful. What makes this issue so complex is that Microsoft is using highly fallible technology to replicate an existing practice that is itself both problematic and practical. People are writing about the app not only because Microsoft is using crime data to mark communities "to be avoided," but also because this mimics something most city residents do already. Whether we like to admit it or not, we avoid certain parts of the city — especially on foot, especially at night and especially if we are carrying something valuable. When friends visit, particularly women, we advise them on safer routes or offer to pick them up in a car if an area is dangerous. We keep an eye out when we move about the city, looking for signs of trouble. This is called "street smarts," and it is practiced not just by middle-class white folks but also by low-income residents, people of color and tough guys. Staying in one piece in many communities involves knowing which blocks to avoid. Codifying something matters. Banks always discriminated against people of color and poor neighborhoods, but it got much worse when redlining became official policy. Since the advent of the Internet, technologies that are widely used by major corporations have a form of codifying power. This app will further mark some communities as places to avoid, exacerbating abandonment and creating a self-fulfilling prophesy. Folk knowledge is absent. "Street smarts" is often about relationships with people you know, specific incidents and particular places, not about raw data in GIS. As author Sarah Chinn wisely points out in the AOL article, most violent crime occurs between people who know each other. There is simply no way to create an exclusively "data-driven" application for street smarts in a way that actually makes people smarter. Note to IBM: The pathway to "smarter cities" involves smarter citizens, which goes beyond access to "data." This app would not teach us how to read, live in or navigate a city — it would simply chop the city up into "safe" and "unsafe" areas. This is a practice we want to undo, not replicate. All of us, especially if we are white and not poor, have avoided places based on some "sign" or reputation. Sometimes this is probably quite wise — I've been mugged, and I now know why I should have avoided that place. But we have all likely avoided places based on unfounded fear, one that permeates our society and constantly helps reproduce spatial inequality. We should be looking for ways to reduce the "automatic avoidance" instinct, not build it into our cell phones. Perhaps we should be thankful to Microsoft for raising a much-needed debate. Chinn made the not-quite-tongue-in-cheek suggestion that a better app would help young men of color identify areas to avoid getting profiled. Instead, how about an app that points out areas that you may avoid because you imagine them to be dangerous, but that are in fact relatively safe to explore? Nice. Reminds me of Michael Moore walking in the middle of South Central with Barry Glassner in Bowling for Columbine. maybe we need an app with a map of the homes of the 1%. I'd like to see their anonymity reduced while making more apparent the wide discrepancy in incomes. This is like what is always said about New Orleans. "Don't leave the French Quarter!" What BS. Leave the French Quarter is the FIRST thing I did when I went there for the first time. I'm from NYC, came up in the seventies too, and have never been mugged so I consider myself pretty street smart. NO is a vibrant city full of beautiful interesting people places and things. The French Quarter on the other hand is usually full of vomiting coeds who have left their safety net for the first time. Point of this screed: Explore and be smart about it. Step one is get your head out of your smartphone. I understand that this isn't the most politically correct app nor does it make our generation look too good, but I think it can be useful. I personally own a car which makes me look of a much higher social standing than i am, and i do not know my way around Providence well at all. Something like this makes me feel better about not knowing where i am, and if it makes me feel safer about driving around or leaving my car on a certain street, then i say all the power to it. 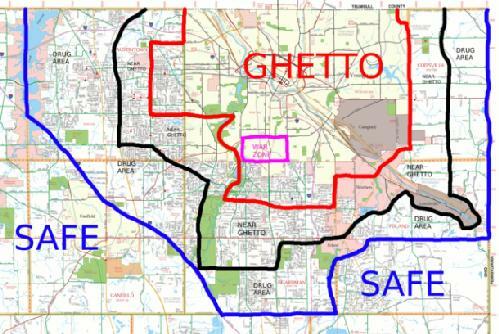 I teach in an area that is deemed "the ghetto". I feel as comfroatble here, as I do anywhere else. The only time I ever feel unsafe here, or anywhere else for that matter, is if I'm here during the late hours. Who is to Blame for Evictions in Spain?